In Heian period (8th ? 11th century), the center of Buddhism culture was Kyoto. Especially, Yen Group. They had produced statues from noble-class’ orders. On the other hand, one craftsman had gone to Nara. His name is Raijo. Unfortunately, the record of his actions have never remained, but we can find the record of Kocho who is grandson of Raijo. Kocho had the best pupul, Kokei. They had put all their energies into produce statue, because many statues and temples have disappeared by Genpei war between Taira clan and Minamoto clan at Nara. Their statues were rich in originality. At that time, Mappou Shisou (one of eschatology) prevailed in the years that he lived. Noble clung to Buddhism, they built temples. And the same time, Hounen, Shinran, Dogen, Eisai and Nichiren are appeared, they put forward a new Buddhism (called Kamakura Buddhism). Buddhism changed from noble’s to common people’s. After Genpei war, Japan had been ruled by Samurai. They liked realistic statues. For that reason, many realistic statues were produced. Kokei, Unkei, Kaikei and Tankei were appeared. It’s Kei Group. Their statues are popular still now. Almost current craftsmen are following in their footsteps. The hallmark of Kei group is realistic description (of human body). And using Gyokugan (crystal eyes). Why they were watched? There are some reasons. 1. They could study structure of statues in detail, because their main work were ‘restoration’ at Nara. 2. They could get great chance to produce statues, because many statues disappeared by war. 3. Yen and In group had been hated from New administrator, Minamoto-no-Yoritomo (the first Shogun), because they joined hands with noble. 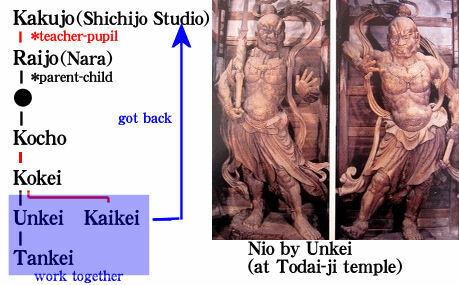 Especially, Inson of In group produced statue to put a curse on Minamoto clan by Taila clan’s order. Kei group got back to Shichijo studio at Kyoto. Kyoto became the Buddhism central city again by Kei group.